Does anyone else out there love deli sandwiches? You know the ones I am talking about. They include stuff like coleslaw, Thousand Island dressing, lots of meat, bacon, and melty cheese. The bread is usually stacked a couple of slices thick and when you order it, you wonder how you are EVER going to finish it. The Reuben is one of those sandwiches. Typically made with pastrami, Thousand Island dressing, sauerkraut, and swiss cheese, it is a site to behold. If you are lucky enough to have one of these in New York City where they may have originated at Reuben’s Delicatessen, you will fall in love (with the sandwich not necessarily the person you are eating with). 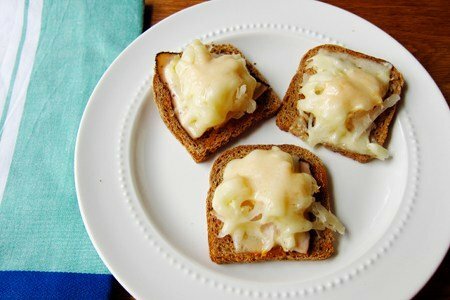 This Mini Reuben is the BEST little snack for watching football or a debate. You can eat three of these cuties instead of a large sandwich and feel satisfied. I love how it incorporates a bunch of pickled cabbage (sauerkraut) so you get some veggies with your snack. There is no real cooking here. Heck, you don’t even need an oven! Just use a toaster oven to cook these for about 6 minutes. You can find rye cocktail bread in front of the deli section of your supermarket. If you can’t find it, just cut up a loaf of rye into smaller pieces. I used turkey pastrami for this, but almost any salty deli meat would work. Also, I didn’t use Thousand Island dressing because I didn’t have any so I just mixed some mayo and ketchup together. If you have pickle relish, that would be a nice addition to the spread. Do you love deli sandwiches? Which are your favorites and have you tried to make healthier substitutes? Heat oven to 400 F. For easy clean up, line a baking sheet with foil Mix mayonnaise and ketchup in a small bowl. Put 24 slices of bread on sheet and spread with ¼ teaspoon of the mayonnaise ketchup mixture. Add a small slice of pastrami, one tablespoon of sauerkraut, and a drizzle a little more “sauce”. Place a piece Swiss cheese on the top. Bake for 6-8 minutes. Enjoy! You can make these ahead and just heat them when you are ready to eat them. Also, you can make a bunch and put them in your lunch box for a great room temperature sandwich bite. Yum Yum. For the vegetarians out there (you know who you are) a bit of tempeh works perfectly. Ohhh, these look delish!! Yummy! Great idea to make minis! Try them with turkey, they're just as delicious. I use turkey pastrami because my husband doesn't like regular. I love Reubens. That picture made me hungry! When I was pregnangt with my 2nd daughter, I couldn't stomach meat for a while. I made a reuben with tomatoes instead of the meat--it was actually very good too! Wowww they look really yummy. Dear Snack Girl: FYI, a Reuben is traditionally made with corned beef, not pastrami. Just an FYI. I just leave the meat off of mine and pile on the sauerkraut. Also I can get a cocktail rye at the store that has all food ingredients. It's the only commercially made bread I buy. This looks so amazing! Thank you so much for sharing! These were so delicious! I went a little sauerkraut crazy and doubled the amount in the recipe, but that's just me I love kraut! Beautiful pictures too, thanks for sharing!